The Gunung Gading National Park near Lundu is world-famous for its Rafflesia flowers which regularly bloom near the Park headquarters. During those times, tourists flock to see the largest flower in the world but it can be difficult to predict and the blooming period is very short. It seems to be most common in November, December, February and March but can happen at any time of the year. There is also some very good trekking in the Park. 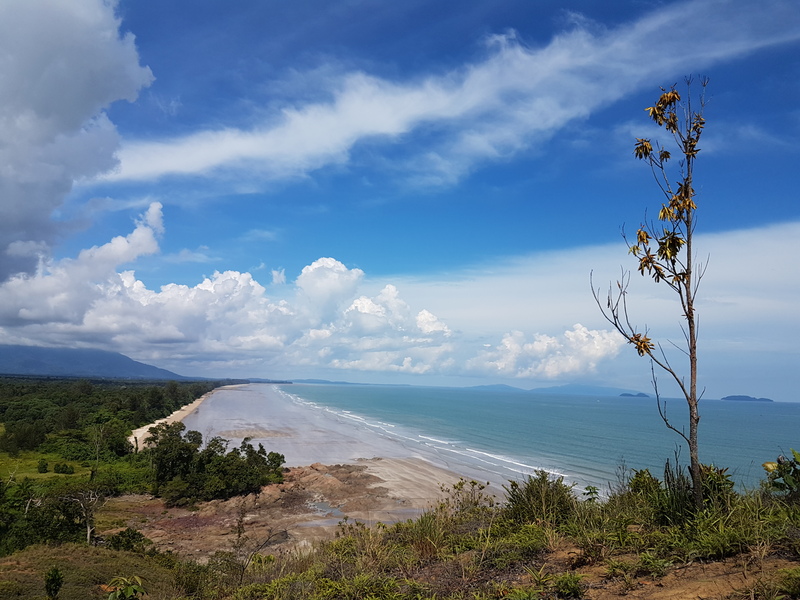 There are numerous minor trails near Park HQ – mainly plank walks in order to see the Rafflesia without damaging them by stepping on them, plus a couple of viewpoints of Lundu town and the South China Sea. The Gading range consists of several peaks including three that are over 800 metres high and one to the north – Gunung Sebuloh – which is considerably lower. The lowest of the three is Gunung Lundu, at around 823m. The central peak of the range is Gunung Perigi, and the eastern peak is Gunung Gading itself, about one kilometre away from Perigi and much more accessible. 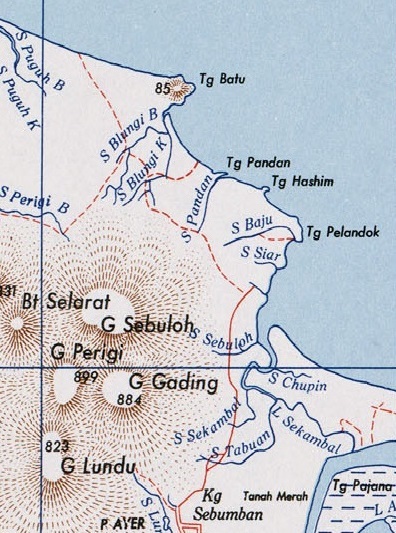 After a fair bit of research of old maps, SRTM data and at the Park HQ itself, the excellent Department of Survey and Mapping Malaysia has finally put the debate to an end and confirmed that the height of Gunung Perigi is 892 metres and Gunung Gading is 889 metres. This is based on the new topographic map MY512A series. Therefore Gunung Perigi is the true summit of the range, but is only 3 metres higher than Gunung Gading. Gading peak can be reached in under 3 hours by fit hikers, so can definitely be done quite easily as a day-hike. Quite aside from the accommodation, the Park HQ (40m above sea level) is excellent – with a place to park, informative staff, an ‘Interpretation Centre’ full of information, and even a shower! It’s just a shame they don’t have a detailed topographic map of the range. From Park HQ, the Gading summit trail leads along a clear forest path with plenty of signs.There are three waterfalls near the trail – with junctions at 115m (for Waterfall 1), 235m (for Waterfall 3) and 305m (for Waterfall 7). Between the junctions for Waterfalls 1 and 3 is Batu Apek (‘the old man rock’). The story goes that an old Chinese man got lost in the forest and then spent several days praying here before finally finding his way out of the forest. He returned daily to pray here and there is a shrine to this day. The shelter that the rock gives, plus the water source within it, would certainly make it the obvious spot to stay if lost. Getting lost these days seems quite unlikely, given the large number of signs and the red and white paint on rocks next to the trail. The red and white very much resembles the Indonesian flag which is rather bizarre! You may encounter one or two leeches but leech socks are not strictly necessary. Looking at old photos of trail maps for the area, it seems that Perigi summit used to be an option for hikers. It is no longer mentioned as widely, either because there was little interest in hiking there or because the management don’t want to risk people becoming lost. The reason remains unclear, but if a trail is not used for months or years it soon becomes invisible – part of the forest once more. Anyway, at around 500m above sea level there is a ‘no entry’ sign on the left. This may have been where the old junction for Perigi was, but one source suggested the trail to Perigi summit starts beyond Gading summit. Anyone who has visited Perigi summit is encouraged to leave a comment below to clarify matters. During our visit in October 2018, we didn’t spot the barbed wire or the helipad, but there were numerous oil drums, a presumed water tank, and the wooden frame of a large shelter, presumably made from durable ironwood (‘belian’). There are no views from the peak, but just a few flags and summit posts with incorrect elevation data on them. The temperature here is delightful. For those with plenty of time, the trail continues beyond Gading peak and down to Batu Bekubu (‘fortress rock’). Apparently the Batu is 2-3 hours (return) from Gading summit so quite a considerable extension to the hike. 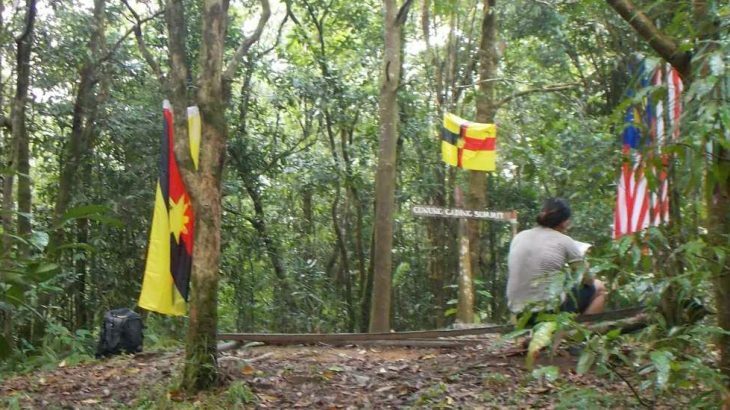 Another site of historic interest, Batu Bekubu was the site of a communist basecamp. Strong hikers can be back down at Park HQ for a shower in around 2 hours. 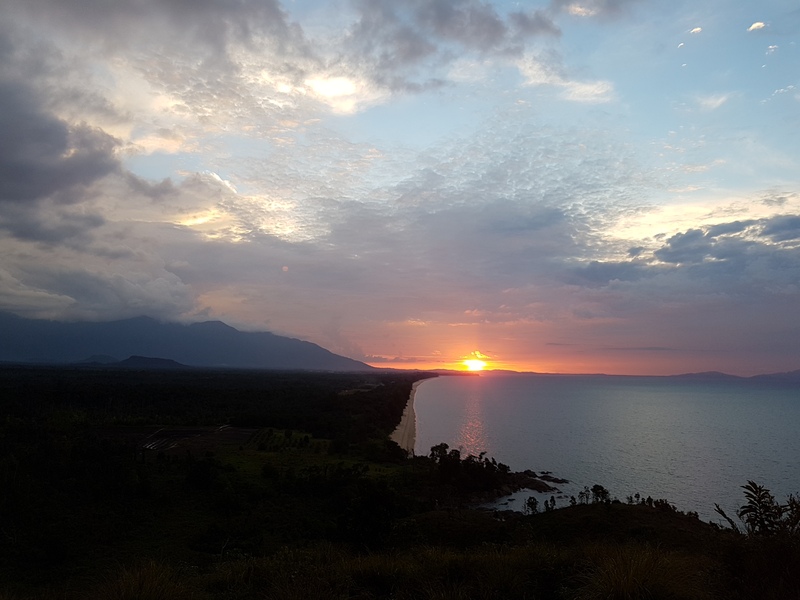 For those staying in Lundu or at nearby Pandan beach, it is definitely recommended that you visit the tiny Bukit Gondol (85m elevation) on the coast at Tanjung Batu, Pugu beach. 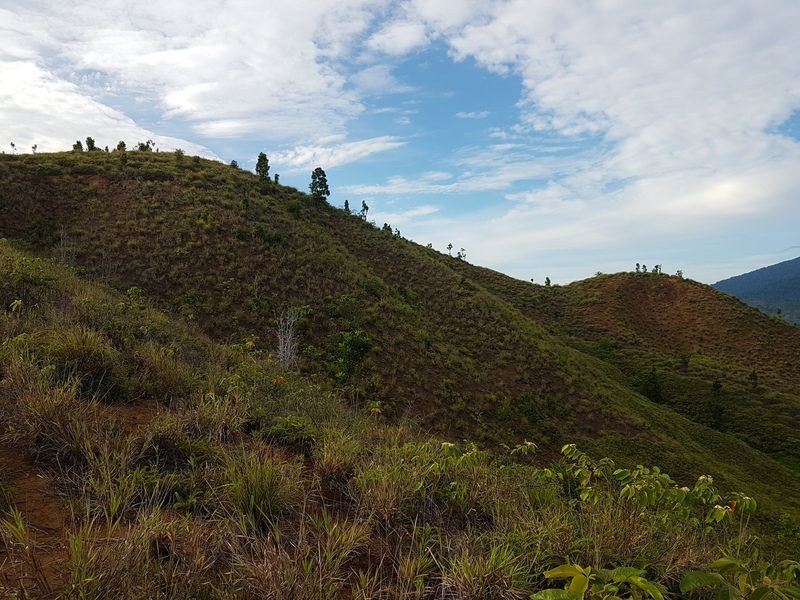 From the top of this tiny, grassy hill you will have fabulous views of the Gading range, the Berumput / Kanyi massif on the border with West Kalimantan, the Santubong peninsula in the distance, and the ocean below. There are even pitcher plants here. Getting there: Gunung Gading is very close to the town of Lundu, which is less than 2 hours by car from Kuching. 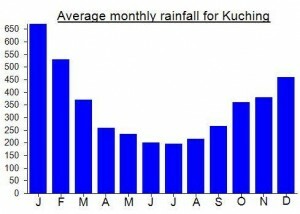 There is also a regular bus service from Kuching. Accommodation: Available at Park HQ, in Lundu, nearby Pandan beach, or a much wider choice back in Kuching. Park HQ or Pandan beach is probably the best option. Permits: The entry fee is RM10 for Malaysians and RM20 for foreigners. The office opens at 8am. Overnight camping is not permitted. Water sources: Available at Batu Apek (195m), 295m and 350m on the trail to Gading summit. Featured, Sarawak (Malaysia) Spesial. permalink. Well, the Department of Survey and Mapping Malaysia has now confirmed to me via email that “the height of Gunung Perigi is 892 meters and Gunung Gading is 889 meters. The source of informations is referred to the new topographic map MY512A series.” There you have it. Perigi is 3 metres higher than Gading. The old colonial era map was right (relatively speaking) and SRTM is wrong. That means I will definitely have to head back for Perigi sometime!!! Continuing on from Serapi near Kuching, we took the coast road towards Lundu, including a lovely little ferry crossing (very short but well worth the one Ringgit per car!) called Rambungan Ferry. Great views out to Santubong and back to Serapi. Once near Lundu I got my first glimpse of the Ribu on the border with West Kalimantan – Gunung Berumput / Kanyi / Pueh. A mysterious range that had been the original plan for this weekend before my flight schedule got changed by several hours making it unlikely for us to accomplish it in time. In the foreground…. the pleasant-looking Gading range. 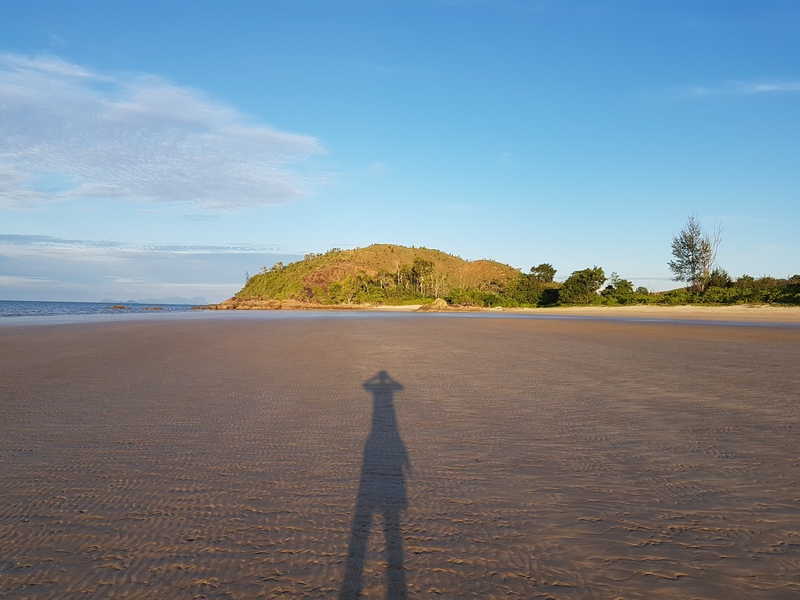 We decided to stay at Pandan beach – Pandan Gold Coast. Not a bad choice and close enough to Lundu to head in for some food in the evening. Before that, however, we went to Pugu beach and up onto the little Bukit Gondol (85m according to an old map) overlooking the coast. 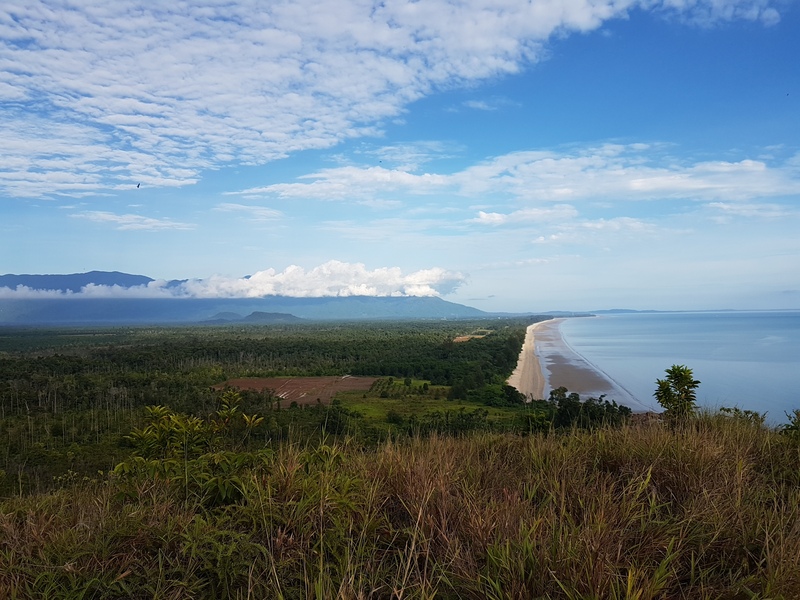 This spot is growing in popularity and it is easy to see why – a gorgeous empty beach and this little blad hill with great views to Gading and Berumput / Kanyi to the west. At sunset it was stunning and we had lenticular clouds form for a few minutes over the Kanyi range. It’s about one hour return from the closest place to park your car. Well worth it. With Gading the following morning, I was once again impressed with the professionalism of the staff at the Park HQ. Really friendly and obviously interested in their job. I can imagine the place being packed with tourists when the Rafflesia bloom, but from what I could hear, November was a likely time for the next blooming. With no information on Perigi, we just hiked up Gading itself. A nice hike, clearly marked. My GPS gave a reading of between about 889 and 901m at the summit, so it is still possible that Gading is higher than Perigi. I have emailed the authorities to see when the two were last surveyed…. I’m planning to hike the whole mountain range From Kampung Biawak (near Jangkar) all the way to Kampung Pueh. Will let you know if this is confirm. Yes, the Berumput/Kanyi range. Instead of just hiking to a peak, planning to hike the whole range. In a planning stage, and if found a suitable date in 2019, will go for it.